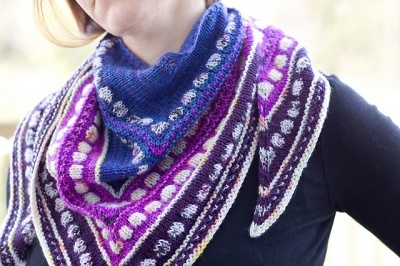 The bundle of yarns, which comes with a special download code for the pattern. 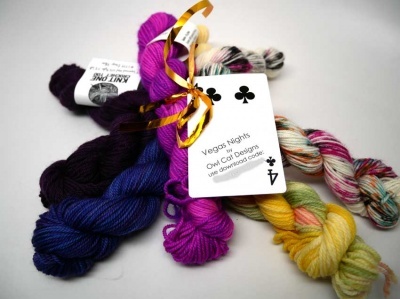 The same Vegas yarn bundle, untied so you can see the skeins better. Yum! 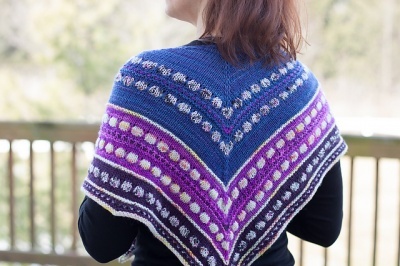 A great shawl design from Simone Kereit of OwlCat Knits, created using the yarns from five different yarn companies! 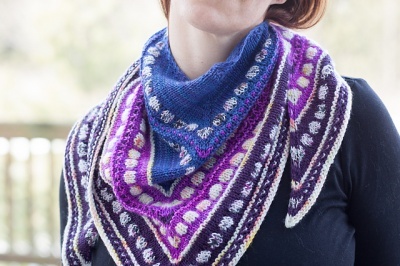 This fun shawl is the result of a collaboration between 5 yarn companies (and me), who all dyed a special mini skein to be joined in one shawl! A collaborative project for the TNNA 2018 Winter show in Vegas, we wanted to tie the theme into some of the other things this city has to offer: bright lights, deep desert night skies (if one leaves the lights behind) and many incredible shows! 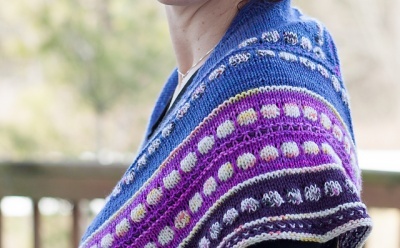 A top down shawl --- it is an updated take on the classic triangle shawl, with added width for easy wear-ability and fun stripe and drop stitch patterns creating a distinct Spotlight look. Easy to knit and just the right size to try out new yarns and combine some bright colors with a hint of desert night! 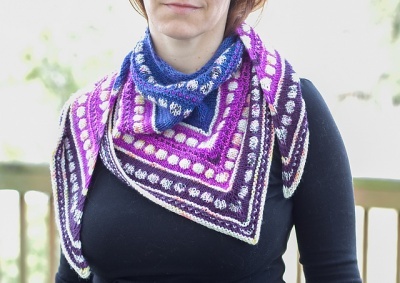 You must get the pattern on Simone's Ravelry page here. This web page is for the kit only! Notice that the "real" colors of the yarn as shown in the second photo on this page shows some marvelous variations and brightnesses that somehow are missing from the photo of the shawl (which I just nabbed from Simone's Rav page). 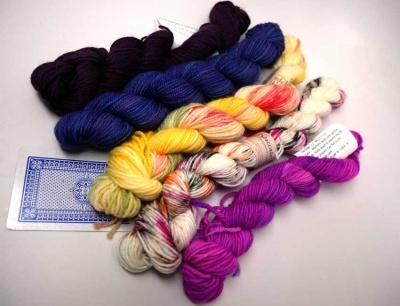 Each kit contains 1 mini skein from each company as well as a code for free download of the pattern (through 4/1)! What fun!